Our roving reporters, Diane and Roger Brown, have been exploring again. 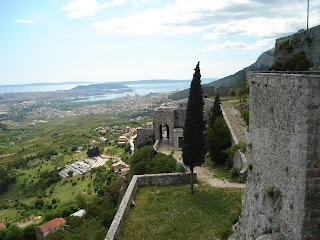 Here's their report and photos of the historic Klis fortress, near Split. The second photo shows the view towards Split. Looking eastwards from our terrace across Kastela Bay, perched high in the mountains that rise beyond Split and Solin we can see the imposing Fortress at Klis. We decided on a clear fine day to give this ancient site a visit. The approach from Split or Solin to Klis is well signposted and once there you will find adequate free parking. 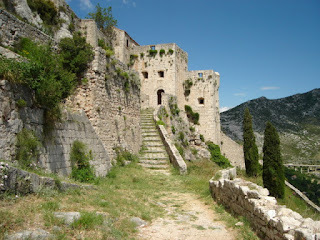 The entrance fee into the Fortress is 10 kuna per adult and 5 kuna for children, good value for money. Ask for a leaflet, which gives the history as well as a guide to the Fortress. The site is well preserved with ongoing renovations. On a clear day the views are magnificent to the mountains beyond and the coastal views stretching from Trogir to Makarska and the nearby islands. Klis village has a mini market and bars where you can take refreshments after your exploration. Well worth a visit.